Free Express Delivery in Australia when you order more than one. 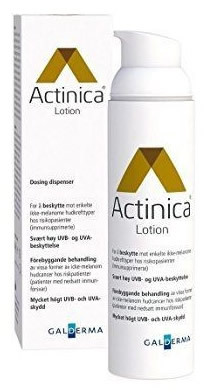 Actinica Lotion protects from both UVB and UVA rays. It contains photostable broad spectrum filters and is waterproof. Actinica Lotion has also hydrating properties for better skin conditioning. The absence of fragrance and conventional PEG emulsifiers ensures that the lotion is well tolerated so that it can even be used on highly sensitive skins. Apply Actinica all year liberally each morning to any areas of skin exposed to the sun during the day. Apply Actinica before applying other cosmetic products (allow Actinica to be absorbed into the skin for a few minutes first). Reapply following longer periods in the water or if you have been sweating heavily. Avoid exposure to direct sunlight and wear protective clothing. Individual skin surfaces vary: the following table provides you with approximate dosage for the different areas. The level of protection may be reduced if a smaller amount has been used. For optimum distribution and a pleasing skin feeling you may apply the full dose in two applications, e.g. one pump and the second pump 5-10 minutes later. point for the dosage required for other areas of skin. emissions do not comprise a full dose. Pump slowly in order to receive the full dose.